Kyle Richmond is tired of peacefully, fruitlessly waiting for the world to get better. As Chicago’s resident vigilante, Nighthawk, Richmond uses his inherited wealth to finance his personal mission to eliminate crime and corruption, and his efforts to protect the city are the basis of Marvel’s hardest-hitting series. Nighthawk isn’t afraid to tackle complicated subject matter involving the treatment of people of color in the U.S.; it charges into these issues without fear, and uses them to create a complicated, provocative superhero story with huge emotional stakes for its black male lead. David F. Walker’s story examines the ramifications of violence on both individuals and the larger community, and the art team of Ramon Villalobos and Tamra Bonvillain (with guest artist Martín Morazzo) capture the brutality of that violence without sacrificing superhero spectacle. Chicago is a city plagued by violence, and this year has been one of the worst. With four months still left in the year, Chicago is quickly approaching last year’s total numbers for both shooting victims and homicides, and the city is on track to hit its highest homicide rate in almost 20 years. The Chicago Tribune published a very informative piece back in June about the various elements that have led to the extreme hike in homicides in Chicago, and Nighthawk has touched on a few of these issues, specifically gun proliferation and declining public distrust of the police. The current climate in Chicago makes it a prime location for a superhero to set up shop, but the problems in Walker’s story aren’t unique to Chicago. Nighthawk is a book deeply informed by Walker’s personal experience as a black man living in the United States, and he’s used this first arc to tackle heavy material regarding racial dynamics in this country. The very first scene of the series had Nighthawk taking out a gang of white supremacists, and the police have become a major opposing force as Nighthawk tries to weed out corrupt members of the Chicago P.D. A police officer not being indicted for the shooting death of an unarmed black teenager is the catalyst for the riot that erupts in this week’s Nighthawk #4, and the plot of this issue is especially topical in light of recent events this summer. After stopping a group of white supremacists taking advantage of the riots to open fire on people of color, Nighthawk is confronted by a police officer who quickly shoots him before he can explain the situation. The image of a black superhero getting shot in the back by a police officer has considerable cultural significance when people of color continue to lose their lives to police officers in situations where deadly force isn’t necessary, but real-world victims like Philando Castile and Alton Sterling don’t have bullet-proof body armor to save their lives like Nighthawk. The moment when Nighthawk picks himself up off the ground is pure superhero fantasy, and not only does Nighthawk survive a bullet to the back, he’s strong enough to give the cop that shoots it a devastating beatdown. Given the production schedule of monthly superhero comics, it’s very unlikely that the killings of five police officers in Dallas had occurred when Walker wrote the scene where The Revelator detonates an ambulance full of explosives in the middle of a police blockade. It’s hard not to think of that real-world tragedy, and the bombing death of the perpetrator, during that Nighthawk scene, which involves a man of color blowing up police officers because he wants to see them punished for the unjust killings of other people of color. 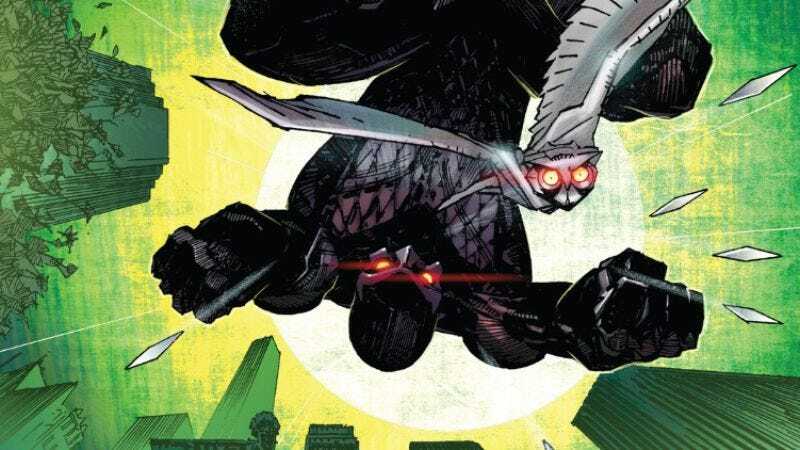 Like the best nemeses, The Revelator is a dark mirror of the central hero, showing what could happen if Nighthawk lost himself to the anger and rage burning inside. Kyle Richmond often remembers the words of his mother warning him of the dangers of a life dictated by violence, and those are the words that prevent Richmond from becoming someone like The Revelator, another man of color who is similarly exhausted by the injustices committed against his community. Both Nighthawk and The Revelator are killers, but Nighthawk only kills when he’s fighting people that want him dead. He kills to protect himself and others, and while those actions are still morally complicated, it gives the impression that Nighthawk is a soldier at war while The Revelator is a straight-up serial killer, gruesomely murdering people whom he believes weren’t punished thoroughly by the justice system. Violence plays a huge role in the emotional storytelling of this series, and the art team has a difficult challenge in realistically conveying the impact of the action while presenting it with the dynamic energy expected from a superhero comic. Composition and color are key tools used to satisfy that challenge. Villalobos starts the issue’s big action sequence with the only two-page spread of the book, creating a dramatic wide-screen image across the top half to signify a shift in the pacing and atmosphere. Bonvillain uses very limited palettes for the opening scenes, but the start of the action brings a wider variety of colors to heighten the spectacle. That opening spread combines green, orange, yellow, blue, pink, purple, and teal, and coloring a gritty, street-level book with these vibrant shades keeps the reader constantly aware of the fantasy that governs the storytelling. That first shot setting up the action is all about expanding the scope and intensifying the energy, but the art team shows restraint when the punches are actually thrown. Bonvillain lowers the contrast as Villalobos gets up close to the action, and using more subdued colors in these moments grounds the violence to make it more visceral. The sensationalism returns when Nighthawk shoots up the pick-up truck and sets it ablaze, a sequence presented with severe angles (a barrage of bullets flying straight at the reader!) and searing hot colors, but the art team tones it back down for Nighthawk’s encounter with the police officer that shoots him. After Nighthawk gets off the ground, he engages in a fight that is broken down in a 16-panel grid, allowing the creative team to get very specific with each beat of the violence. Bonvillain uses the same limited palette for each panel, and while the warm coloring on Nighthawk makes him one with his similarly warm surroundings, the light blue of the cop’s shirt makes him stand out. The contrast of the blue shirt against Nighthawk and the environment reinforces that the police officer is separated from the community he’s supposed to be protecting, and that motivates the cop’s aggressive response to the situation he discovers. Villalobos doesn’t try anything fancy with the angles for this 16-panel fight. He zooms in and out, but has each panel on roughly the same visual plane, making small adjustments when the action calls for it. (When Nighthawk takes his opponent to the ground, the angle is slightly skewed to accentuate the tumble.) This isn’t an especially thrilling superhero fight; it’s blunt and raw and you can sense the characters’ increasing weariness with each new hit. Nighthawk ultimately knocks out the cop, but a surge of vomit rushes from his mouth as he remembers the warning his mother told him as a child. The vomit is an impulsive physical reaction to the overwhelming rush of negative emotion he just channeled, and it’s so important that Walker includes it twice in the script. Nighthawk will resort to violence to accomplish his mission, but he’s not able to fully accept this course of action because of the values instilled in him at a young age. This violence is corrupting him, and one of the most compelling conflicts of the series is Kyle Richmond’s internal struggle to not lose himself to the violence that becomes more and more frequent. In her Comics Panel review of Nighthawk #1, Caitlin Rosberg worried that Nighthawk might have difficulty finding an audience given its surface similarities to higher profiles new releases from Marvel, Black Panther and The Punisher, and those worries are founded given the sales of the first three months of Nighthawk issues. Last month’s issue came in at 165 on Diamond’s list of estimated comics sold, 129 slots below Black Panther and 109 slots below The Punisher. Nighthawk is one of Marvel’s lowest selling monthly titles, but it’s in pretty company down there. Howard The Duck, Mockingbird, Moon Girl And Devil Dinosaur, Patsy Walker, A.K.A. Hellcat, and The Unbeatable Squirrel Girl all hover in similar sales territory, and these are all some of the most inventive, exciting books Marvel is publishing right now. The fact that these titles don’t offer more of the same may be why they don’t connect with the larger superhero audience. The best-selling superhero comics are the ones with the broadest appeal, and ones that challenge genre and industry norms have an uphill climb to reach popularity. Superhero comics are still dominated by white male creators telling the stories of white male heroes, and limiting perspectives limits the types of narratives being explored. That might explain why superhero comics can feel so damn repetitive, and recent efforts to improve representation have resulted in more engaging, surprising superhero titles from both Marvel and DC. Nighthawk is a book with a black writer, a Latinx artist, a trans woman colorist, and two women on the editorial team (assistant editor Christina Harrington and editor Katie Kubert), and they’re all working together to create a superhero comic that actively engages in serious cultural conversations about race, privilege, and violence. It’s an ambitious, risky title that is approached with great care by everyone involved, and hopefully more readers will reap the rewards of the passion and hard work going into this series.